We live in the day of modern technology and that’s not all bad. Texting for example is a tool, it can be used for good or for bad. 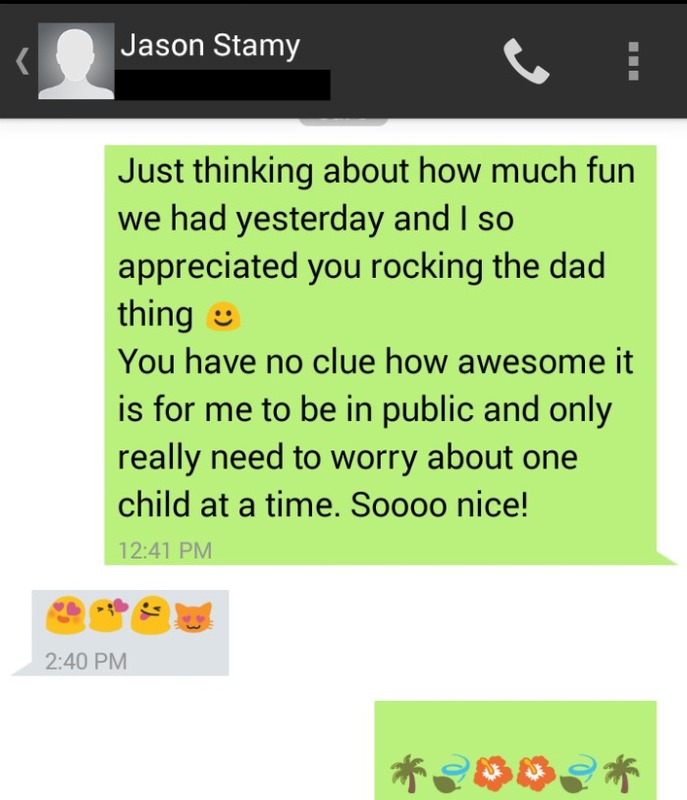 Here’s how a text changed our marriage for the better! Jason has never been a texter. Although to be honest, aside from that short time we dated, he’s never been one to leave notes either. I’ve accepted that romance does not a relationship make and learned to appreciate my strong steady man for the good husband that he is. For several years I got up with my man and packed his lunch. This was something he appreciated me doing and I enjoyed doing it for him. Even after our first was born I continued packing his lunch and my own at the same time. But pregnancy with our second changed a few things and now I simply try to get as much sleep as I can. When I packed lunches for him I loved slipping little love notes into his box, I even created a few fun ones that can be printed for my readers here (that’s you!) to use. I knew he enjoyed them but he rarely said it and didn’t reciprocate. All of this was one sided and I was fine with it. When I quit packing his lunches, the notes also stopped. I’m sure he missed them and after awhile I realized that I missed leaving them for him. One particular Monday I kept thinking about how much FUN we had enjoyed as a family together over the weekend. I realized that the entire time we were out, I hadn’t taken our toddler potty one single time. Even the messy pants had been handled by my rock-star hubby. Since I typically have both boys all the time, just being able to focus on one child was a huge blessing to me. I decided I needed to let hubby know how much I appreciated that. So I sent him a text. Like I’ve said before, Jason isn’t a texter. So when all I received in reply was a row of emojis I laughed and responded in same before going about my day. A few more days went by and I had something else positive to share with him. So I sent him another text and he responded with more emojis. This continued for a few more days and then something started happening. My non texting hubby began texting me! A photo here, a short sentence there. Definitely not an everyday thing, but a little bit of fun has been added to our marriage. Do something new, different, out-of-the-ordinary for your marriage. Don’t expect anything out of it, but give and see where it takes you. A simple act can change things up for your marriage and bring a bit of fun to your marriage. 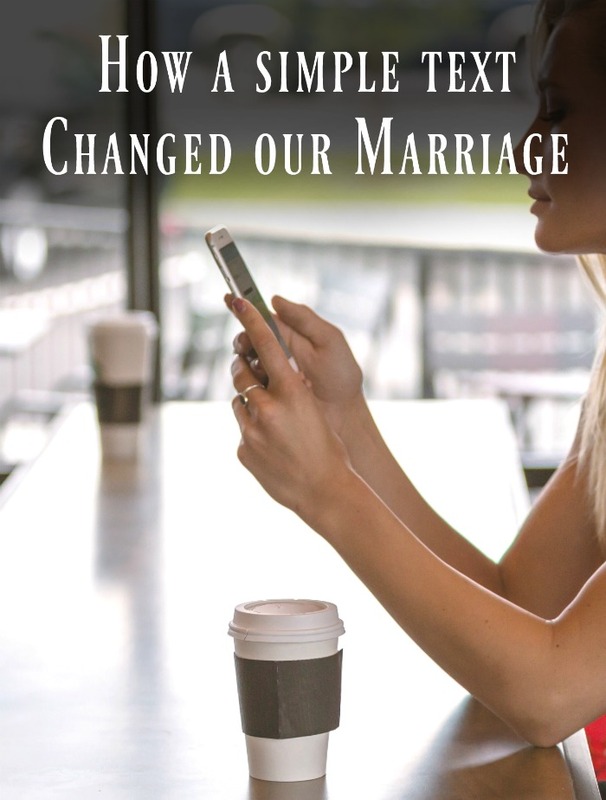 How a text changed our marriage is simply one example of something small becoming something big. Perhaps in your case, a written note would make a bigger difference, or simply being at the door when hubby gets home. There are many little things you can do, you just have to do them! A great reminder of how such little things can grow a marriage and even change one in trouble. I love texting mine and leaving notes in his truck or underwear drawer. He never says anything, but I know he appreciates them. He’s not much of a texter either, but I think eventually he will be. Love the little reminders of how to add a bit of communication and fun to my marriage. Also, sometimes doing what I’m not use to doing and stepping out of my comfort zone is a good thing. Beautiful tidbit of advice.